It’s also a shame that Paul didn’t live long enough to find out that he had been wrong—dead wrong—about the centerpiece of his theology. He predicted, he promised, he preached passionately that Jesus would soon descend through the clouds to welcome his faithful remnant. He insisted that all Christians gear their lives to this eagerly anticipated event—he was really serious about this: “I, mean, brothers, the appointed time has grown short; from now on, let even those who have wives be as though they had none…” (I Cor. 7:29). There are a lot of feel-good aphorism in Paul’s letters, I Corinthians 13 being his prizewinning piece, “Love is patient and kind…”; “…faith, hope, and love abide, these three; and the greatest of these is love.” Of course, these are the Paul texts that are read aloud in church—so it’s hardly a surprise that Christians assume that he earned his saint-stripes. Of course everyone knows too about his stunning conversion on the road to Damascus: Jesus spoke to him from the sky! What more could you want? The aphorisms I quoted above are from Romans, Chapter 12. During the course of this year I’ve been reviewing Paul’s Letter to the Romans, one DC post on each chapter. We have arrived at chapter 12—and here, despite the feel-good stuff, we can glimpse Paul’s sinister theology and his cult-twisted thinking. Of course, Christian apologists will whine about this dig about cult thinking. Why would I say that? Well, for starters, Paul assured his followers that he talked directly with dead-yet-alive Jesus; he told them too that he had figured out a magic formula for living forever, which only a very few, by the way, would be able to access. And, oh yes, there’s the Halloween touch, a dead body coming back to life. That sounds pretty whacked to me. Indeed, if you presented this menu of beliefs to many Christians in this blunt way, they would see why “cult-twisted thinking” is not far off the mark. Christians who think they can merge their own domesticated version of the faith with New Testament Christianity—which truly is hard to stomach—well, they haven’t spent time carefully reading the gospels and epistles, probing beyond Paul’s feel-good texts. I’ve not yet seen this on too many greeting cards: “And those who belong to Christ Jesus have crucified the flesh with its passions and desires” (Galatians 5:24). This teaching is no surprise from a man who offered this advice to the Corinthians: ““It is well for a man not to touch a woman” (I Cor. 7:1). “Your bodies as a living sacrifice” is cult talk. “…leave room for the wrath of God; for it is written, ‘Vengeance is mine, I will repay, says the Lord.’” This text is from Deuteronomy 32:35. Paul believed that sin had been introduced to the world by Adam, and that God’s default emotion ever since has been wrath; thus the deity is permanently pissed off at humanity, and Paul had discovered the remedy, the way to divert the wrath, namely, believe that God had raised Jesus from the dead. So we’re back to the Halloween stuff—and that ranks pretty high on the cult scale. 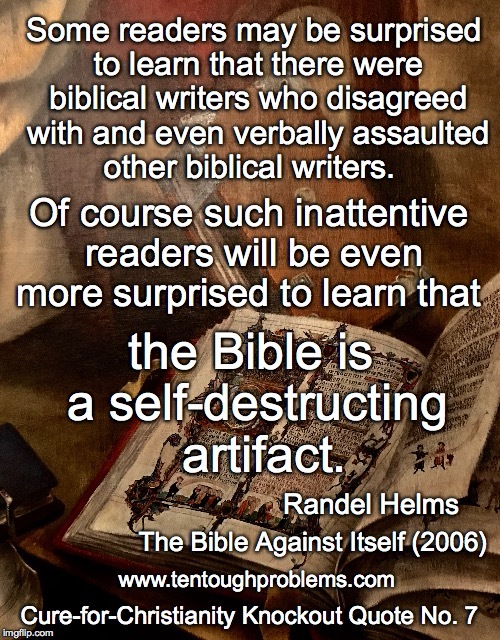 There is so much incriminating information in the New Testament—it really is there for discerning people to notice—which prompted Randel Helms to observe that “…the Bible is a self-destructing artifact.” So yes, I urge Christians to figure it out: Read the gospels and epistles carefully, which includes sleuthing, searching and comparing texts—even reading between the lines for insights. Don’t these verses sound like something from the Jesus playbook? 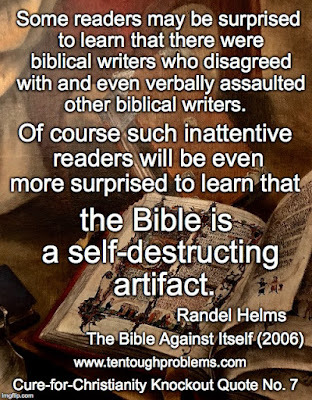 Yet, Paul never refers to Jesus as a source of wise teaching. What better place to have said, “As Jesus taught us….”? At the end of Chapter 12 Paul counsels: “…if your enemies are hungry, feed them; if they are thirsty, give them something to drink; for by doing this you will heap burning coals on their heads.” Such an echo of Matthew 25, no? Yet in this text Paul is quoting Proverbs 25:21-22, (including the obscure comment about heaping burning coals upon their heads). Why not quote Jesus instead of Proverbs? Probably for the very simple reason that Paul knew very little—if any—of the teachings of Jesus. He was in the dark on this—and he seems not to have cared. The gospels hadn’t been written yet—but the great puzzlement is that Paul hadn’t connected at all with the much-vaunted oral tradition that New Testament scholars are so sure carried “reliable information” about Jesus. But Paul wrote “occasional” letters, apologists tell us; they are directed to specific issues and situations. So Paul just “happened” not to mention any of Jesus’ teachings and parables, his miracles or virgin birth; nor the walking on water, changing water into Chianti, raising Lazarus. Give me a break. It’s much more likely that Paul wrote before any of this stuff had been invented. Maybe even before an earthly Jesus of Nazareth had been conjured by the novelists who wrote the gospels. Oh horrors, are the Mythicists on to something? And Paul himself was very good at invention, which is not hard when you’re stoked on hallucinations. In Roman 12:2 he recommended: “…be transformed by the renewing of your minds, so that you may discern what is the will of God…” Uh oh. Acute skepticism should kick in. Cult leaders have always been convinced that, with their renewed minds, they can discern the will of God. Paul’s epistles demonstrate the abundance of bad theology that emerged from his mind. David Madison was a pastor in the Methodist Church for nine years, and has a PhD in Biblical Studies from Boston University. His book, Ten Tough Problems in Christian Thought and Belief: a Minister-Turned-Atheist Shows Why You Should Ditch the Faith was published last year by Tellectual Press.